Scars of Mirrodin is the first set in the Scars of Mirrodin block. 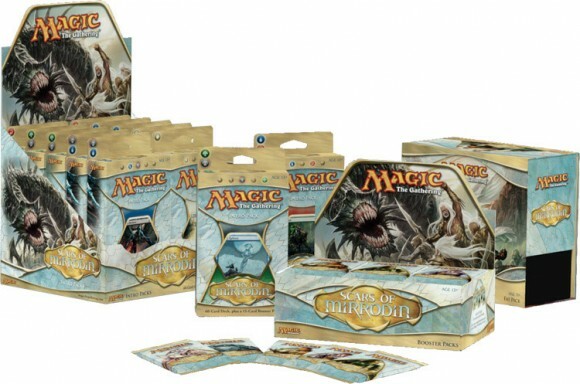 The set features 249 black bordered cards, including randomly inserted premium versions of all cards in the set. It will be available in intro packs, booster packs and fat packs. The set introduces new mechanics including: Metalcraft, Infect, and Proliferate. New Planeswalker cards are included. The set describes the conflict between two major factions – one being Mirrodin, and the other being the invading forces of Phyrexia. Cards aligned with these two factions are watermarked, as previously seen with the Guild aligned cards in Ravnica block. The two factions are also mechanically separated, with the Phyrexians dealing largely with Poison, Infect and Proliferate, as well as sacrifice or leaves play effects, while the native Mirrans use mechanics already introduced or similar to those of the original Mirrodin set – Imprint, Indestructible, Charge Counters the new Metalcraft mechanic, as well as Mana Myr and Spellbombs. Only 40 cards of the set have the Phyrexian symbol on them. All other cards except for Basic lands and Planeswalker cards have a Mirran watermark. The story also revolves around several planeswalkers. Elspeth Tirel (as a new card of the same name, Elspeth Tirel) returns while a new planeswalker by the name of Koth is introduced who appears to be of Vulshok heritage and thus would be native to Mirrodin. His card is called Koth of the Hammer, making his name an acronym of the name of the card. Venser and Tezzeret are also involved in the storyline, the former confirmed to be getting a new card, Venser, the Sojourner. Being set on Mirrodin, the expansion features themes and settings already known from that plane. For example, creature types and tribes of these such as Leonin (Cats), Vampires, Loxodon (Elephants), Elves, or the Human tribes of Vulshok, Sylvok, Auriok, Moriok and Neurok. Artifact creatures such as Golems and Myr also return. The promotional card given to participants at the Prerelease tournaments was Wurmcoil Engine, a powerful artifact creature. The Launch party event promotional card was Steel*kite. Boosters of Scars of Mirrodin come with a bonus sixteenth card that is either a “tips & tricks card” or a creature token from Scars of Mirrodin or a poison counter token. 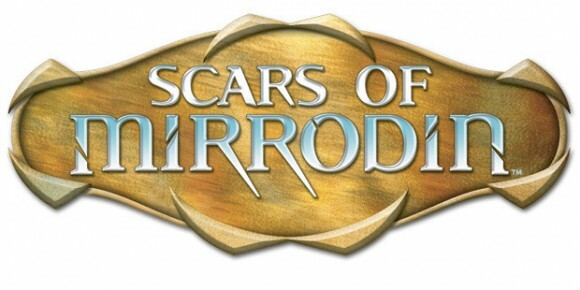 One face of the Scars of Mirrodin bonus card has one of five different rules tips or is one of 9 different creature tokens or a poison counter token. Infect is a new keyword that causes creatures to deal damage to other creatures in the form of -1/-1 counters, similar to Wither. However, in addition to this, cards with Infect deal damage to players in the form of poison counters. The poison mechanic was introduced in Legends but has never been strongly supported. The mechanic resurfaced in Time Spiral block with a reprint of Swamp Mosquito and the Poisonous keyword (which does not appear in Scars of Mirrodin). Poison counters will be a major theme of the entire block. The ability word Metalcraft gives a card a bonus if its controller controls three or more artifacts. Scars of Mirrodin features a new Mox named Mox Opal that has Metalcraft. The Indestructible mechanic returns with new “Darksteel”-themed cards, as does the Imprint mechanic from Mirrodin. 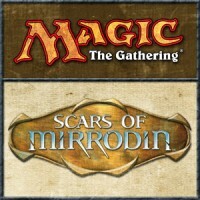 Add a Review for "Magic: The Gathering – Scars of Mirrodin"